Drive by the low-slung stone building on East 53rd Street with the massive winged pig painted on the facade and you probably wouldn’t think anything has changed since Foreign & Domestic opened more than eight years ago. Step inside and take a cursory look at the menu. Your eyes rightfully hit the brakes at the ethereal Gruyere and black pepper popovers ($8) and crispy beef tongue ($9), long staples of the menu. Your inner Homer Simpson gurgle-moans. All still feels about the same. Then you notice the pops of color from vases of flowers. You wander into the bathroom and admire the foxes and hens on the wallpaper. Back in the dining room, you look through the window and see the more defined outdoor seating section. Maybe you catch a glimpse of a full brunch menu at the host stand. The space is still relatively spartan, with almost imperceptible shifts that only the most perspicacious might recognize. But, for longtime visitors of the restaurant, the true revelation comes when you take inventory not of the things but the people. 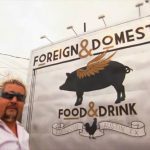 Foreign & Domestic’s founder, chef Ned Elliott, sold the restaurant late last summer to focus his attention on future locations in Houston and his hometown of Cincinnati. The new Austin proprietors? The couple working in fine-tuned near-silence in the open kitchen that sits at the foot of a counter resembling a modern New York diner. Obsessive or professional followers of the Austin dining scene likely will recognize one half of the duo as chef Nathan Lemley, who worked in the kitchen for Elliott for about three years before heading to Parkside. He and his life and business partner, chef Sarah Heard, also a Parkside alumna and fellow Southeast Texas native, say they purchased the business from Elliott for a couple of reasons. They didn’t want to see it go away when Elliott turned his attention beyond Austin. 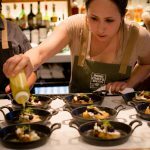 They also felt it was a safer bet to take on the mantle of an established restaurant with a simpatico point of view rather than striking out completely on their own in an increasingly unstable restaurant market populated with diners plagued by short attention spans. The restaurant under Heard and Lemley vibrates with a slightly more subdued energy, while the menu takes cues from Foreign & Domestic’s original strengths: comforting and thoughtful seasonal dishes that utilize as much of the animal as possible without coming off as showy or pretentious in their execution. It’s a similar song, but one sung with a new voice. The aforementioned beef tongue is one of three dishes (the others being the popovers and fried chicken biscuit) Lemley and Heard have kept on the menu (for now) in part as fulfillment of a contractual obligation with the expansion-minded Elliott, and it’s as good as or better now than it’s ever been. Braised and then flash fried, it is a substantial hunk of irony meat crispy on the outside and soft through the middle, its meaty depths countered by the tang of pickled onions, lift of mint and whip of horseradish ($9). The beef tongue also appears on a four-course Nose to Tail tasting menu that runs $42. A salad of sweet peaches and greens ($9) is an ode to simplicity, though you might not want to try to make that smoked walnut vinaigrette at home. Those peaches come back around, arriving fanned across medallions of pork slow-cooked to a carnation center and seared to an auburn edge that sit on a salty-sweet summer confetti of tomatoes and corn ($25). In a kitchen that has experimented with every part of the pig, from ears to tails, the new chefs utilize the pig’s collar for that dish, a choice that hearkens to Lemley’s time at Parkside, where he made excellent charcuterie. Those dishes aren’t trying to trick you or go out of their way to impress you. But there is something very hard about making something seemingly so simple so appealing. When the kitchen really started rocking me back on my heels was with the homemade pasta dishes. Ribbed spirals of gemelli hid all sorts of delights. There were the tiny bits of guanciale, often overcooked or oversized in many similar dishes; the ramp used in the pesto to give it that grassy riverside quality; infinitesimal bits of cashews for crunch; and the umami of grana padano that tied it all together and lifted it up ($12). The textures, the balance, the subtlety, knowing exactly when is enough — that’s what I want from a kitchen. You know what else I want? That little bit of lemon zest that zips its light through flavors and exalts the dish. I also found it in the puffy Parisian gnocchi ($13). Ferment and woodsy funk abound in that bowl with morels, asparagus and koji butter, but then that little bit of acid lightened the assault just enough to transform the decadence to joy. No, not every dish is going to slip punches and move deftly across the palate. The cheddar-capped burger ($18) made with chuck, brisket and steak trimmings? It’s coming at you with all its juicy glory, and possibly due to an overly excited server, it also came at me with bacon and egg added at $2 a pop even though we didn’t ask for it. A burger that good doesn’t need glutinous adornment or distraction. A rosy medium-rare New York strip ($28) with a solid sear kept it simple with whipped potatoes and charred cauliflower accompaniments. But more often than not, the kitchen zigs with almost every other zag. Venison tartare ($13) made with leg, not F&D’s formerly trademark heart, and stacked like a homogeneous Rubix Cube on crunchy papadum could have stopped with the pickled yolk, but the dukka introduced the idea of comfort spoken in another language. Tart creme fraiche balanced molasses-tinted carrots caramelized to within an inch of their lives, while bitter arugula and a tingly carrot-top pistou enlivened the whole affair ($22). Even a cast-iron black butter chocolate chip cookie ($7), one of the richest I have ever eaten, benefited from the dimensionality provided by blackberries and peach leaf ice cream. And, while chocolate and coffee are no strangers at dessert, you don’t always find them scattered and shattered across a placid carrot custard ($7). I sat at the bar one Sunday morning listening to the sizzle of the grill commingle with the mellowed volume of Toto singing “Hold the Line.” My fried chicken biscuit ($14) and its breakfast sausage gravy, brimming with smoked paprika and cayenne, landed in front of me, and it felt like one of those hungover mornings when an old friend is making breakfast for you out at their lake house before the others have shaken themselves from bed. Of course, your friend likely wouldn’t have the skill or concern to add the puckering cut of confit lemon that elevates the dish. Eating that brunch, and thinking about my dinners, I realized that Foreign & Domestic accomplishes a tricky thing. The food comforts you (almost to the point of belt-busting discomfort at times) while also surprising and impressing you without grandstanding or self-indulgence. It feels like a regular hang but also a standout one. Should a neighborhood restaurant feel this considered? Should a destination restaurant serve food that delivers such comfort? The rebooted Foreign & Domestic proves that the answer to both questions can be yes, but more importantly it proves that labels don’t really matter when the food is this good and this honest. Hours:5:30 to 9:30 p.m. Tuesday-Thursday, 5:30 to 10:30 p.m. Friday and Saturday, 10:30 a.m. to 2:30 p.m. Sunday. Prices:Appetizers, $8-$13. Entrees, $18-$28. Dessert, $7. Brunch, $7-$19. The order:Peaches and greens, ramp gemelli, 44 Farms strip steak, strawberry buttermilk pie. Notes:Limited lot and street parking available. Happy hour Tuesday-Saturday from 5:30 to 6:30 p.m. The Bottom Line:With comforting and well-executed food, new owners and chefs Nathan Lemley and Sarah Heard have struck a balance of destination and neighborhood restaurant.